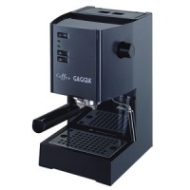 alaTest has collected and analyzed 29 reviews of Gaggia Coffee. The average rating for this product is 4.1/5, compared to an average rating of 4.4/5 for other products in the same category for all reviews. People really like the price. The reliability is also mentioned favorably, but many are less positive about the size. There are some mixed reviews about the design. We analyzed user and expert ratings, product age and more factors. Compared to other products in the same category the Gaggia Coffee is awarded an overall alaScore™ of 77/100 = Good quality. It's a solid, tried-and-true top performer for its class. A fantastic first machine. My machine is rebadged as a Starbucks Proteo Romanza, but the crappy paint job and white lettering hasn't affected its performance thus far. The bottom of the machine still says "Gaggia" and "Coffee". If you finally want to have real espresso at home, this espresso maker will show you the way. I plan on having this machine for quite a while. After owning 3 steam espresso makers, I finally get to taste real espresso in my own home. We learned all about crema and espresso while researching our Gaggia purchase. Solid, consistent, a fast heater, a good looker, a bit noisy but worth it in the end! For $300 dollars it is a great machine and makes top notch espresso. This machine is the real mc coy! Great quality machine at a great price, except for the sub-par foaming ability. Purchased two machines back to back... one broken, other defective. The Gaggia Coffee is a no-frills machine that is one of the best values around. Great machine but dont skimp on the grinder!!! It‘s a big machine that does exactly what its supposed to do.